The built-in terrain editor allows you to change the terrain relief on the spot with the help of brushes. In the editing mode you can draw various terrain features, such as rocky ground and other craggy details. All brushes modify only the selected LOD. To start editing the current terrain, click the Edit button at the top of the Terrain Global tab of the Parameters window. When you're done editing, click either Apply to apply all changes and exit the terrain editor, or Cancel to discard your changes. To draw with a brush, press ALT + LMB. To grab the height / color / material (depending on the brush type) at the current height of terrain and set it as a brush value, use CTRL + LMB. To change the brush size, use the mouse wheel. The following set of brushes with their specific modes is used to modify the terrain. Replace — paint the color specified by the brush color over the terrain albedo color. Add — add the color specified by the brush color to the terrain albedo color thus lightening it. The lighter the color, the lighter the result will be. Completely black color value does not change anything. Subtract — subtract the color from the terrain albedo color thus darkening it. The lighter the color, the darker the result will be. Completely black color value does not change anything. Smooth — blur albedo colors blending and softening color transitions. Color — color of the brush. Intensity — color intensity of the brush. Lower intensity values correspond to darker colors, while higher values - to brighter ones. Opacity — strength of the brush when applying the layer color. Lower values create a more translucent brush, and higher values create a more opaque brush. After using a Diffuse brush do not forget to regenerate a coarse albedo texture so that introduced color changes would be seen on all levels of detail. Replace — replace the current terrain height with the specified height value. Lower height values will lower the surface down and create cavities, while higher values will raise the terrain height. If a surface has different heights, the brush will level them. Add — add the specified height to the current height and raise it till the maximum height of a terrain is reached. Subtract — subtract the specified height from the terrain current height and lower it till the minimum height of a terrain is reached. Smooth — level the difference between the neighboring heights. The Opacity parameter determines the rate at which the brush is applied. The Height parameter determines the height value for the brush. This value is added, subtracted or applied at the corresponding point of the heightmap. After using a Heights brush do not forget to regenerate a normal map so that new relief features would be correctly lit. 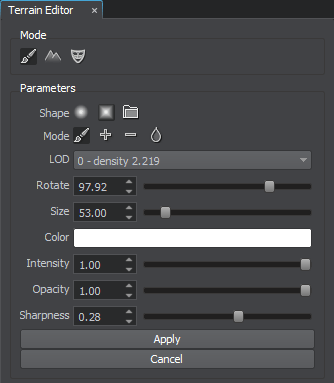 Replace — apply the selected intensity value at the corresponding point of the selected LOD. 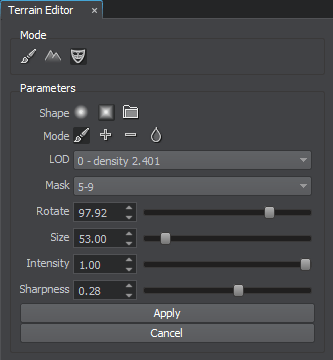 Add — increase intensity and clarity of the selected mask at the corresponding point of the selected LOD. Subtract — decrease intensity and clarity of the selected mask at the corresponding point of the selected LOD. Smooth — blur spreading boundaries of the selected mask at the corresponding point of the selected LOD. The Intensity parameter determines mask intensity for the brush. Lower values create a more translucent (less intense) texture, and higher values create a more opaque texture. 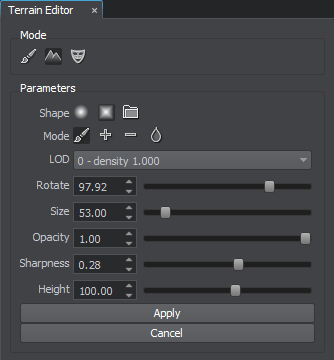 LOD — albedo, height, or mask LOD of the terrain to be modified with the brush. Rotate — rotation of the brush. Can be used to make brush fit best for a specific task. Size — size of the brush, in units. Determines the area to be affected by the brush. Sharpness — tip of the brush. The lower the value, the sharper and smaller the tip; the higher the value, the flatter and bigger the tip.